‘Our River’ in detail – A great field study ! This FIELD STUDY webpage is a wealth of information, including photos, diagrams and maps of the Conwy river. it reveals the source points and tributary streams and other rivers that make up a large and important mountain and hillside drainage network. The fresh water flows out into the tidal Conwy Estuary where it joins the sea flanked by Deganwy and Penmaenmawr. 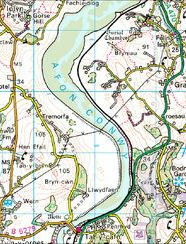 A webpage that gives great information of the tidal stretch of the River Conwy. It advises on river flow and tidal flow and the difference in tide times relative to Liverpool Dock Tidetables. It also briefly describes the route of the Conwy ascent Race and Tour; an annual event organised by the DCP. Places to go, Things to see and do in Conwy - a "ten of the Best" web page. Thinking of using Marine VHF radiuos with your kayak? Thinking of getting a hand held radio for kayaking but don't own a ship? A ship portable radio licence(SPRL) are quite straightforward to obtain, and it can all be done online via Offcom. Take a look at these webpages and others for more info.